The exhibition Nahnou - Together Now tries to trace back influences and references of art movements and art production in the Middle East with a focus on Syria and Jordan, and the connections to other artist and institutions. In an exchange project students from London experienced an unknown urban and cultural environment - these impressions formed a starting point for the creation of numerous pieces of artwork or writing. The exhibition design created a distinctive, playful and yet informal and functional environment by using scrolls of grey foam for timeline, projection background and seating - commenting on the ongoing nature of the project, forming a functional sculpture that connected the planes of floor and walls. 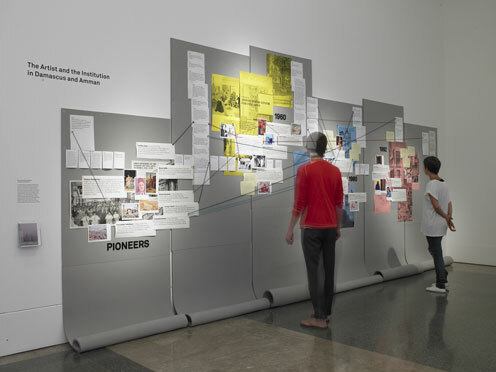 The work-in-progress rhetoric of the show was further underlined by the decision for a low-key and flexible approach for the complex time-line wall featuring a carefully selected rage of paper sheets in various colours, different pins and strings. Quotes of students were shown in handwriting straight on the wall.